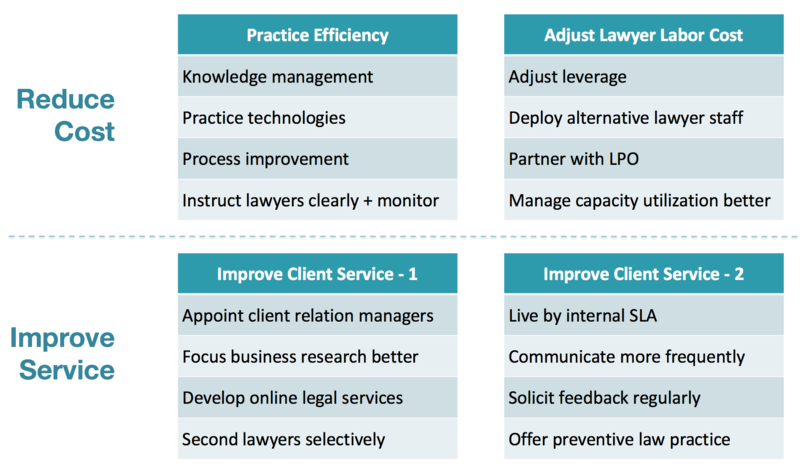 In the current ultra competitive market for legal services, large law firms must improve client service delivery. 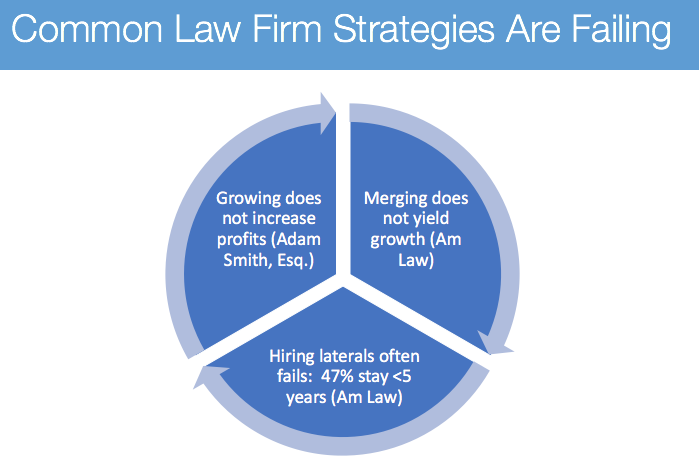 I explain why in this post: the stratification of large law firms, the failure of traditional strategies, the lack of differentiation among most firms outside the top tier, and client dissatisfaction with law firm service. Winner takes all is a common story, including in the corporate legal market. Ten years after the economic crisis, legal market surveys tell the same story consistently: “Increasing stratification among firms” Choppy Seas for The Am Law 100, 1 May 2017, American Lawyer, also notes that the “country’s largest firms are still experiencing healthy growth in RPL while that figure is on the decline for their smaller competitors.” Revenue per lawyer is a key indicator of financial health. Many other studies come to a similar conclusion: an emerging top tier of some 20 firms with a big gulf from all the rest. What should firms not in the top tier do? 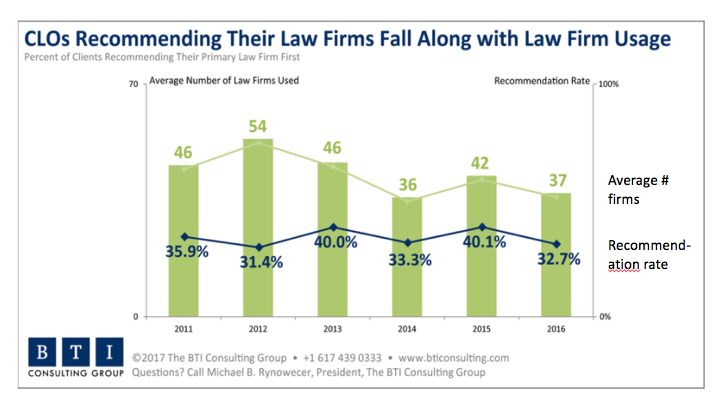 The Untold Story Behind Big Law Mergers: Revenue Slips, Costs Rise in The American Lawyer in March, notes that an ALM Intelligence report found “that most major law firm combinations since 2000 have not resulted in significant growth.” Of course mergers made the firms bigger. But growing bigger did not fuel any additional growth. Global Lateral Hiring by The Numbers: A Look Behind the High 5-Year Attrition Rate in American Lawyer International in February found that “Half of lateral partner hires are failures. To be precise, 47 percent of laterals don’t stay more than 5 full years.” And not staying at least 5 years leads to losses it found. If a firm is not already doing these five things, getting there is not easy. Of course firms should not give up on strategy. Management must recognize, however, the firm’s current market position and have a realistic perspective on just how much traditional strategic initiatives can move its position. So, what choices can management make? Forty firms probably think they are in the top 20. Firms not in the top 20 must think about how they can differentiate from competitors. A few already have: some firms are value players, others are boutiques with specialized, high-end practices. But the bulk of firms look awfully similar. “Clients wonder why their top law firms don’t offer up a budget before being asked, share staffing plans, or offer to introduce new high‑profile laterals. Clients especially wonder why they weren’t offered a customized CLE session like their peer got from their law firm”. 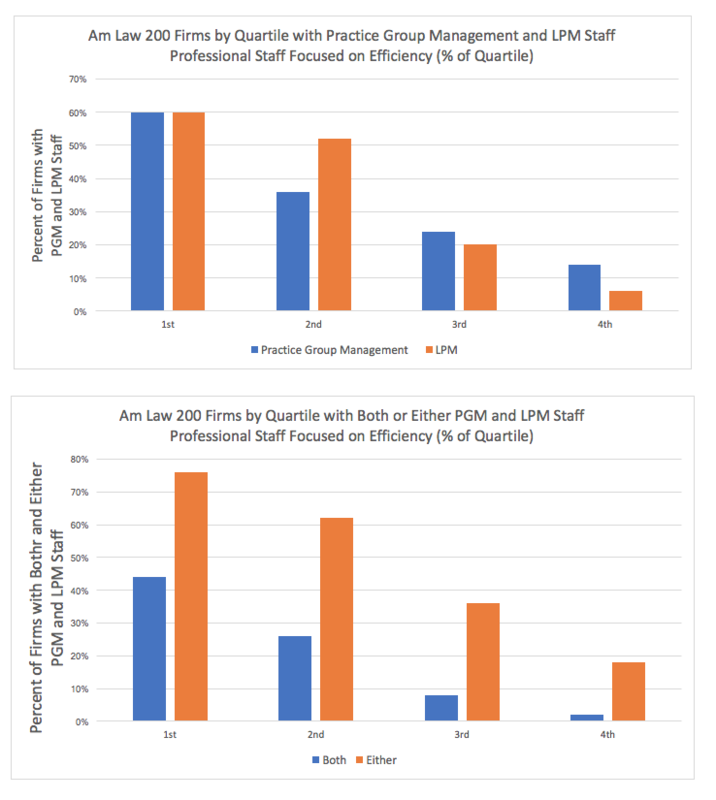 These charts make clear that firms outside the top quartile are investing less in staff that could help them offer better service than top quartile firms. The sky stays in place, despite commentators predicting disruption and the demise of many law firms. Many firms seems to manage without making much change. What I’ve described above is less a looming threat. Rather, it is a big opportunity.